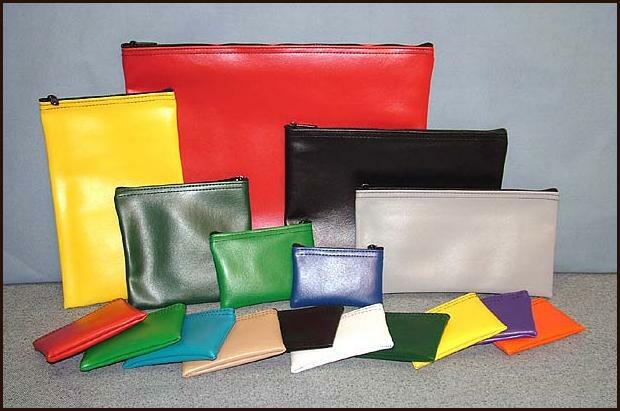 Above are just a FEW of the many different size vinyl bags we produce which are available in 23 different colors. 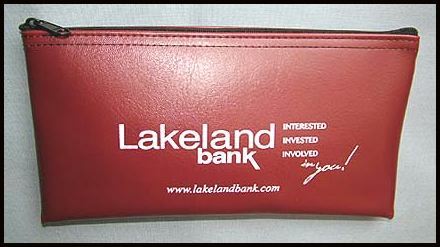 We manufacture all sizes of zippered vinyl pouches and vinyl bank bags. Two of the most common bags are the VBB-611 that measures approximately 6 inches high by 11 inches wide and the VBBT-1 which measures approximately 11 high by 7 inches wide. As with all of our products we can custom design or alter the size of any of the bags or pouches in our present line to accommodate your needs. These style bags are also referred to as zipper wallets, money bags, deposit bags, and currency bags but certainly are not just limited to bank or banking use. There are thousands of uses and applications for these types of pouches. Any of the vinyl bags come in a choice of twenty three (23) different colors. These vinyl bags are a great choice in areas that may be prone to dirt or even liquids because that are water resistant and can usually be wiped clean. The textured laminated vinyl has a "leather like look". These bags are also very popular as a promotional bag and advertising item. We can print things like your business name, logo, telephone number, web site address or whatever advertisement message that you want to convey in the applicable space on the respective bag or pouch. In larger quantities of 125 or more we will NOT CHARGE a printing fee for one color process if you provide the camera ready artwork. Please contact us about special pricing and any custom needs that you may have. For smaller quantities of bags that need some type of printing be certain to visit our page on HOT STAMP PRINTING. We can make these bags in ANY size you need !! !